Alan Maund lived in Worcestershire all his life and had an enthusiasm for steam. He travelled extensively in Britain and built up a large railway photographic archive from the late 1950s onwards. This book is made up entirely of Alan's collection of photographs from across the Midlands. It will appeal to railway enthusiasts, modellers, and those with an interest in local history. Alan started using colour film in 1959 and colour slides make up the majority of the photographs. Many enthusiasts in this era had a policy of filming steam only and ignoring the new diesel interlopers, but not Alan; they do make appearances, even including some early electric classes. A particular passion of Alan's was small industrial steam locomotives, and he restored a Kerr Stuart 'Wren' class 0-4-0 to working order between 1959 and 1961. So in addition to larger British Railways locomotives, their smaller relations are also seen across the Midlands. 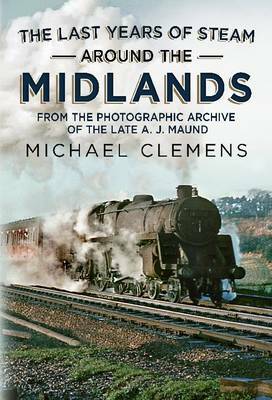 Alan passed on in 1982 and his widow, Wendy, gave Alan's collection of railway photographs to film-maker and author Michael Clemens, whose late father was a friend of Alan's. Alan's collection lives on today at film shows around the country and now in this book.